Tolstoy’s Anna Karenina appeared first in a serialized form between 1875 and 1877, a period during which its author was undergoing a profound spiritual crisis that ultimately resulted in his embrace of Christianity. The novel is a story of crisis, and though its much-quoted opening line (“All happy families are alike; each unhappy family is alike in its own way.”) has a wistful romantic sweep, it opens with scenes of “confusion”: a whirligig of panic as a husband’s affair is revealed, throwing his house and community into disorder. Adultery continues to cause catastrophe throughout the novel, especially and particularly surrounding its central character, Anna, a married woman who falls for a handsome solider. In its time alternately dismissed and praised, the story was nonetheless challenging in its view of society and the soul in the late 1800s. Yet most adaptations of Anna Karenina, either to stage or film, tend towards stately museum pieces in which stiff performers wring their thespian hands with inner torment as the audience take in the pretty frocks. Seeing the title in the listings for the Gate Theatre’s Holiday programme wouldn’t immediately inspire hope of anything different, taking the slot from the seemingly now perennial A Christmas Carol. However, Helen Edmundson’s adaptation in the hands of director Michael Barker-Caven is something altogether unexpected; an exciting and invigorating piece of theatre. Edmundson’s rethinking of the basic dramatic structure of the novel is key. By interlinking Anna and Levin (a reform-minded landowner desperately seeking meaning in his life), two characters whose stories are parallel but largely unconnected in the novel, she introduces an element of reflexivity. 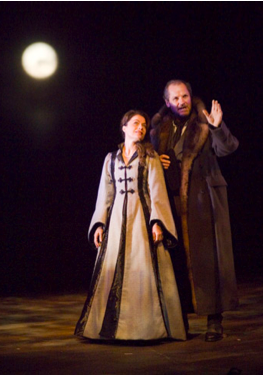 Anna and Levin address each other throughout the play, as if connected telepathically. Their dialogue allows the playwright both to accelerate the narrative by having them comment on and summarise events, but also to critique and analyse both characters’ responses to these and other events in both their own and each other’s lives. This was arguably inherent in Tolstoy’s structure, but where the author had the luxury of 700 pages of text to tease out and explore his parallels and similes, a theatre piece needs more immediate drama if it is to be anything other than a re-presentation. Edmundson provides this while not distorting Tolstoy’s vision of humanity, nor his sense of crisis and tragedy: both of which weigh heavily upon every character action. Caven then takes things to the next level with extremely energetic staging in which the hurlyburly of dramatic movement is echoed in the movement of actors, props, and decor. As befits the trajectory of the story, Simon Higlett’s set is basically a cavernous train station, an open space which doubles as any location with the appropriate shifting of furniture and scenery by the actors themselves. Caven keeps his actors and their environment in constant motion, and yet maintains narrative clarity in juggling Edmundson’s now intersecting plotlines and character dynamics. The beauty of it is the measure of this pace. Caven resists going insanely over the top with techniques more frequently seen in low-budget or avant-garde productions, where they are as much a matter of necessity as aesthetics. He holds the production together masterfully to deliver appropriate dramatic and emotional punch when and where required. Yet he also firmly drives the action forward by keeping the audience on its toes, refusing to sit quietly and sip tea and vodka in tasteful surroundings; instead confronting them with a theatre piece that breaks the boundaries of the comfortable drawing rooms of Tsarist Russia. He is ably aided in this enterprise by a strong cast, particularly the towering Peter Gowen in the role of Levin and Paris Jefferson as Anna. Edmundson has given these actors different challenges from those in a straightforward rendering of the story. The characters are now both within and without the action, and without losing themselves to nods to the audience or direct address, Gowen and Jefferson add to the sense that these characters, this story, and this production refuse to be taken at face value. The formerly central role of Count Vronsky (Anna’s romantic interest) has been inevitably downgraded on a dramatic level in Edmundson’s script, leaving Jonathan Forbes with a more conventional but well managed character to play, but veteran performer Bryan Murray rises above the expected in a strong showing as Alexei Karenin, Anna’s husband. All of the performers are required to concentrate greatly on movement and posture. It is vital to Caven’s approach that moments of stillness or quiet are equally charged with a sense of the importance of gesture and deportment, and to this end, even the smallest of actions becomes theatrically charged. The aesthetic is perhaps best exemplified by the performance of Karl Sullivan, a mute character billed as ‘the muffled figure’. Moving like a dancer, he is the literal spectre of death, a brooding, menacing presence lurking throughout the play and doubling as the poor and downtrodden of Russia and the Angel of Death. Anna is haunted by such death from the opening scenes where she witnesses a man falling under a train at the station, and this, as is well know, foreshadows her own demise. Sullivan creeps, lurks, and hovers at the fringes of the dramatic action until the play reaches its point of catharsis, where the actor begins a rhythmic death dance, pounding out the sound of a steam train in motion and gradually joined by the entire cast apart from Jefferson. All pretense of realist theatre are shed now as Paul Pyant’s lights and the actors pounding, pulsing bodies evoke the literal and metaphorical train which overwhelms Anna and casts Jefferson into darkness. It is not the happiest of moments, but it is a powerful experience, and leaves an indelible memory from a confident, challenging, and confrontational production.